WITH WASHINGTON AGAIN turning the financial screws on Iran, China stands to pick up a lot of the pieces that will get broken in the process. The Iranian state news agency yesterday announced that China National Petroleum Corp. (CNPC) would take over Total’s 50.1% share of the $4.8 billion Phase 11 (of 24) development of the giant South Pars gas field, the world’s largest unitary gas reserve. Terms, including financial ones, are unknown. Neither Total nor CNPC has made a public comment at this point. Confusingly, the Iranian oil ministry subsequently said that the terms of the contract remain formally unchanged, though that is not necessarily inconsistent with CNPC taking over. Last year, in signing on, the French energy company became the first sizeable Western oil and gas company to invest in Iran following the lifting of sanctions on Tehran the previous year. Now the Trump administration has pulled out of the nuclear agreement that enabled those sanctions to be lifted, fresh US sanctions have been imposed that force companies to choose between trading with Iran and trading with the United States. For most Western companies, it is no choice at all. Total had already indicated that it would have to walk away from the South Pars project in the new circumstances. CNPC, which has had a presence in Iran since 2004, already had a 30% stake in Phase 11. Iranian state-owned Petropars owns the rest. The project is intended to supply gas to the domestic Iranian market from 2021 with excess to that requirement being exported, now assuredly eastwards rather than westwards. That gas could either be shipped or sent to China via the network of pipelines existant, under construction or planned across Central Asia and Pakistan. China is already the largest market for Iran’s exports of crude oil and condensates, taking 24% of the total last year. In addition, Chinese banks have extended $25 billion in credit lines for infrastructure investment, suggesting Chinese firms will easily be able to slip into the spaces vacated by Western multinationals and be in a position to negotiate favourable terms now they will be the only game in town for Tehran. IT HAS LONG been expected that China would deploy troops in Africa, even though doing so would mark a shift away from Beijing’s long-held policy of keeping itself, in public at least, at arm’s length from involvement in African conflicts. State media said last year that Beijing would send 700 infantrymen to take part in the UN peacekeeping mission in South Sudan, UNMISS. The first of those boots are now on the ground. The rest — including a small contingent of female soldiers — will be there by March, complete with other staples of ‘self-defense’ — armored personnel carriers, drones, anti-tank missiles and other weapons. China already contributes more personnel to UN peacekeeping missions than any other permanent member of the Security Council. But most of its some 2,000 blue hats, mainly sent to Africa, are engineers, medical staff and other civilian workers, not, as in the case of South Sudan, a battalion of combat troops. China has invested heavily in South Sudan’ oil, which accounted for 5% of China’s total crude oil imports as recently as December 2013. However, renewed civil war has since cut production by a third to some 160,000 barrels a day. The troubled situation in the country, which separated from Sudan in 2011, has worsened since last December when the president accused his sacked deputy of attempting to orchestrate a coup. A potential humanitarian disaster threatens to make it worse still. Some 2.5 million people are facing famine; that is on top of 1.9 million already displaced by the conflict, in which at least 50,000 have been killed. Oil-producing regions have seen some of the worst of the most recent violence, but Chinese oil workers in South Sudan and Sudan have been particular targets of kidnappings for several years. 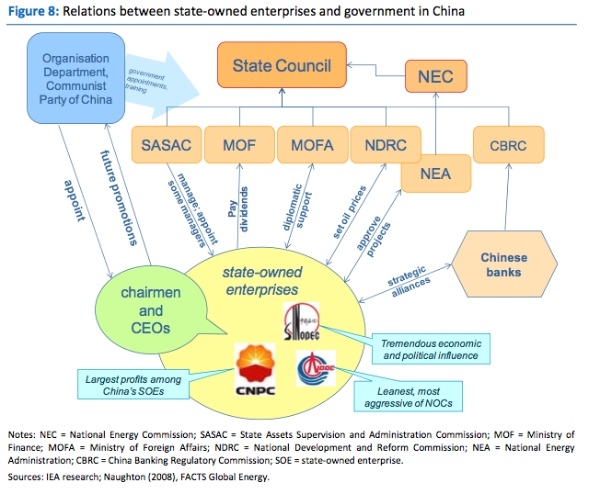 State-owned China National Petroleum Corp. (CNPC) owns 40% of the consortium that dominates South Sudan’s oil industry. Late last year, it signed a deal with Juba to stabilize then increase oil output. Putting troops in the country will stiffen Beijing’s ability to push for a diplomatic end to the conflict, which, in a rare example of cooperation, it has agreed to work closely with the West towards resolving. In this sense, the arrival of Chinese combat troops, even if they are wearing blue hats, underscores not just an international power willing to protect its overseas interests but also one willing to shoulder more international responsibility — for which, it should be said, the U.S. and others have been calling for some time. Just How Good A Gas Deal Is Beijing Getting From Moscow? THE KEY NUMBER we don’t know in China’s insert-your-own-very-large-number-here energy deal with Russia is the unit price state-owned China National Petroleum Corp. (CNPC) will be paying. CNPC has finally signed the agreement to buy up to 38 billion cubic meters of natural gas a year from Gazprom for 30 years starting in 2018 (a new pipeline has to be built first). This Bystander hazards a safe guess that Beijing has got itself a very good deal. The sale has always been necessary for Moscow to wean itself off its dependence on European markets for its energy sales, but merely convenient for Beijing, which has several sources other than Eastern Siberia from which it can meet its growing need for energy, especially cleaner energy than can be generated from its indigenous coal. After 10 years of negotiations between CNPC and Gazprom that have mainly been haggling over the formula that will determine the pricing, all that has changed is the situation in Ukraine. That has given a renewed sense of urgency to Russia’s need to secure non-European markets, while President Vladimir Putin’s two-day visit to China provides the platform from which to announce the deal with political benefits to both himself and his host. President Xi Jinping and CNPC’s chairman Zhou Jiping will have taken full advantage of that. We noted the growing global reach of China’s big three national oil companies earlier this week. It is tempting to see them as a monolithic arm of state policy, and their overseas acquisitions of oil and gas assets as a centrally directed execution of strategic national policy. Yet both those views miss the complexity of their domestic political relationships. We thought this diagram from the International Energy Agency captured them well. While it is no secret that China’s state-owned oil giants, CNPC, Sinopec and CNOOC, have been on a buying spree of overseas assets over the past three or four years, not much consideration has been given outside the industry to what that means in production terms. Now the International Energy Agency (IES) has done just that. And it is eye opening. The IEA estimates that by 2015 China will be producing 3 million barrels of oil a day outside its borders, twice what it produces today. Quite what that means is well illustrated by some comparisons. Three million barrels per day is roughly what the United Arab Emirates, Mexico and Kuwait each now produce. They are currently the world’s eighth, ninth and tenth largest producers. It would be comfortably more than Brazil, Nigeria and Venezuela’s output. They are the eleventh, twelfth and thirteenth largest producers. It would also be three quarters of the way to what China already produces; China is the world’s fifth biggest oil producing nation. This ranking hasn’t come cheap. The M&A consultancy Dealogic (via the Financial Times) says that China’s state oil companies have spent $92 billion since the start of 2009 on oil and gas assets in countries from Angola to the U.S. There is little to suggest that number won’t pass the $100 billion mark sometime later this year as they continue to buy oil and gas in the ground, be it under water or shale, and the expertise to get it out. China, Russia Settle East Siberian Oil Pricing Dispute. The long-troubled negotiations over China’s purchases of Russian oil have reportedly taken a step forward. Russian press reports say a new deal ensures a below-market price for China’s oil imports from East Siberia. Russia’s largest state-controlled oil company, Rosneft, and the pipeline monopoly, Transneft, are to give China National Petroleum Corporation (CNPC) a $1.50 a barrel discount on the oil it gets via the East Siberian-Pacific Ocean pipeline relative to the market price of Russian oil shipped to other buyers from the Pacific Ocean port of Kozmino. China receives the vast majority of its Russian oil via a spur on the pipeline from Skovorodino to Daqing, shown above, that opened in January, 2011. But it is starting to buy Kozmino cargoes as an alternative to Iranian oil. Rosneft reportedly says the deal will cost the Russian side $3 billion a year in revenue. That seems haggling hyperbole, rather than a real number. The arithmetic suggests $3 billion over the life of the contract would be closer to the mark. Whatever the true figure, the Russians may just have to write it off as the cost of ending the dispute. China funded the building of the pipeline with a $25 billion loan but claimed Transneft overcharged for transport costs. These are part of the formula for pricing the oil with which the loan is to be repaid at a rate of 15 million tonnes of crude a year from 2011 to 2030. The two countries still have outstanding negotiations over natural gas. Price is a point of contention in those discussions, too. However, there has been agreement that Russia will start supplying China with Eastern Siberian gas in 2015. This Bystander is starting to pick up details of a settlement between China and Myanmar following Naypyidaw’s unilateral suspension of construction work on the Myitsone hydroelectric dam on the Irrawaddy river. State media report that the two countries “agreed to properly settle matters” at a meeting between Foreign Minister Yang Jiechi and his Myanmar counterpart, Wunna Maung Lwin, who had been dispatched to Beijing as a special envoy of Myanmar President Thein Sein for talks China had demanded. This followed a meeting between President Thein and Beijing’s ambassador to Naypyidaw at the weekend. We understand, however, that Myanmar has agreed to compensate Beijing through further natural-resources concessions, including giving China an increased share of its revenues from the $2.5 billion oil and gas pipeline being built through central and northeastern Myanmar by state-owned China National Petroleum Corp to connect Yunnan to terminals it is building on the Indian Ocean. This will be done under the guise of repaying the loan agreement between China and Myanmar’s former military rulers to fund Myitsone, most of whose electricity is intended to be exported to China. It is unclear when work will resume at Myitsone, in which state-owned China Power Investment Corp. is the main investor. The original announcement said the project would be suspended for the remainder of President Thein’s term of office, which ends in 2016. We also understand that work will continue on six other Chinese-backed hydro-power dams in Kachin State.